Paul Millsap returned to form for the Atlanta Hawks in a 96-91 Game 2 win over the Brooklyn Nets. 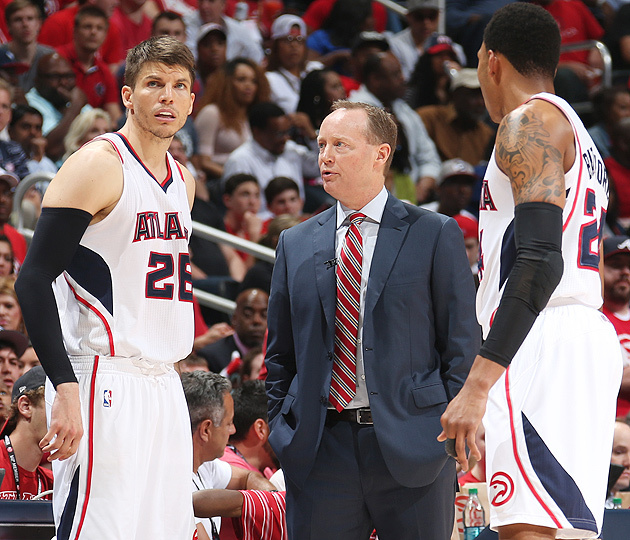 The Hawks entered the postseason with few questions left unanswered. One of the league's strongest teams all season, they had solidified themselves as a contender. Perhaps the biggest remaining unknown was Paul Millsap's health. It was clear who the Hawks were as a team, but they ended the season on a three-game losing streak, mostly because Millsap was either absent or limited in losses to the Wizards, Knicks and Bulls. Millsap's performance in a 99-92 Game 1 win over the Brooklyn Nets did nothing to quell those suspicions. He scored only six points on 2-of-11 shooting, good for 18.2% from the floor. But, because they are a collective, the Hawks won without Millsap playing at his best. At the time, Kyle Korver said Hawks players pick up the slack when a teammate fails to hold up their end of the bargain. It didn't take long for the tables to turn. Millsap was there when the Hawks needed him most for a 96-91 Game 2 win and 2-0 series lead. Time and again, the Nets rotated hard to cut off shooting looks for Korver or Jeff Teague, leaving Millsap with nothing but time and opportunity. Millsap ditched his clunky shoulder pad on Wednesday and took advantage to the tune of 19 points and seven rebounds, including a 4-of-4 mark from behind the three-point line. "It felt good," Millsap said in a postgame interview. "I've been shooting the ball pretty good in practice without the pad, so I got out there, tried it, felt pretty good." It didn't always appear the Hawks would need Millsap to spell them. Atlanta pushed out to a hot 5-of-5 start, before it quickly cooled and settled in for what would become an ugly game. At many points, the ball danced around in disarray and ended with a turnover or bad shot. These were the type of messy possessions you would expect from the Nets but not the Hawks. As one of the most efficient teams for 82 games, the Hawks were due for a rough run. The Nets muddied up their offensive process, and several important Hawks players fell victim to the torrid pace. Nearly every player on the floor was swept into the ether at some point, losing control of the ball or missing badly on a shot he typically hits. Millsap stayed above the fray, however, and sustained Atlanta throughout the night with timely three-point shooting. He did have help, as Korver quietly finished the night with 17 points on an ultra efficient 5-of-7 shooting from the field. In a game where most turned to isolation basketball or brute strength, Millsap and Korver feasted on spacing and smarts. chasing. Korver took off for the shot just a tad earlier than he otherwise would and tricked Anderson into bumping his left leg. Officials noticed and Korver, an 89% free-throw shooter, was on the line. [daily_cut.NBA]Predictably, Millsap was met with less opposition. In fact, Millsap caught the ball outside and looked to pass before lifting up for a shot on multiple occasions. "I was wide open on a lot of shots. The drive and kick helped us out a lot," Millsap said. "But it really started with the guards penetrating, getting me easy buckets, easy layups and a dunk, and it led to everything else." It was reminiscent of the Atlanta offense we've come to know. The Hawks are at their best when whipping the ball around the arc to find open shooters, who sometimes pass up open looks for better layups. There was a brief stint in the second quarter when the entire Hawks team was in sync. During that time, Al Horford, who played despite suffering a dislocated right pinky in Game 1, found Millsap, Korver and Teague for open looks off ball rotation and knocked in one shot himself. Watching Millsap return to form provided a similar feeling. This was his first performance with double-digit points since March 30, and he'd only made four three-pointers in four other games all season. Asked what was different about his shooting Wednesday, Millsap said his shoulder finally felt comfortable without the shoulder pad. "Definitely more range, definitely more mobility," Millsap said. "When you can't pull your arm up above your ears, your shoulders above your eyes, it's kind of tough. So I was able to do that tonight, and more than likely I'll go without it again next game."